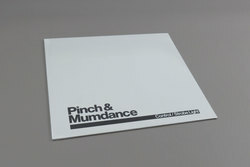 Pinch & Mumdance - Control / Strobe Light. Vinyl 12. Bleep. 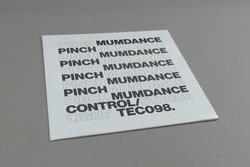 Amother flooring collaboration between Pinch & Mumdance, this time transforming the duo's usual bass heavy sound into an evil eyed Drexciyan electro stinger with Control. While Strobe Light smashes together BMB style drums with a gabba tempo. Approach with caution.... ! The production duo behind the rave-new world sounds of 'Turbo Mitzi' and 'Big Slug (Feat. Riko Dan)' have been busy in the studio recently and return to form with 2 killer cuts designed to shock out the dancefloor. ’Control’ picks up the tempo from the duos previous cuts, rolling at 140 beats per minute, in it’s apocalyptic form. Powerful pads create the tension before sub-heavy kicks and cybernetic snares come pounding and chopping in, building up the mood before a radioactively charged Reese-bassline emerges, rising to the surface, unleashing its terror. This is a stone-cold banger. 'Strobe Light’ returns to the more familiar 128bpm tempo that the pair have previously worked with. Taking a quite unique approach, ‘Strobe Light’ builds evermore, moving into the light, layering percussion up as an intoxicating drone of swirling strings swells and swells - entrancing and empowering in equal measures. this is a highly versatile DJ tool that also makes for an engrossing listen from start to finish. Refined dancefloor ear candy.